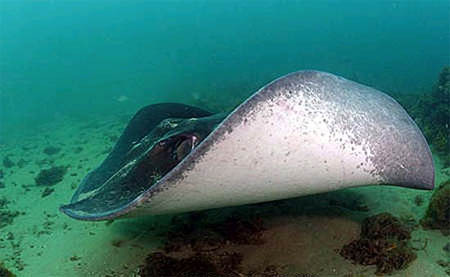 The largest of the rays, these can grow up to almost 7 feel across and 770 pounds. They’re slightly diamond shaped, wider than they are long, with a stocky tail shorter than the length of their bodies as adults. Although they are slow-moving in general, they can flap their pectoral fins fast enough to create a small shock wave (cavitation) if threatened. They usually have two stinging spines in their tails, but are not aggressive and cause harm to humans only when startled or threatened. English language common names include short-tail stingray, bull ray, giant stingray, shorttail black stingray, shorttail stingray, smooth short-tail stingray, and smooth stingray. Other language common names are gladde pijlstaartrog (Dutch), ignelivatoz (Turkish), isokeihäsrausku (Finnish), kortstert-pylstert (Afrikaans), oru (Maori), pastinaca (Italian/Spanish), peitschenrochen (German), pigrokke (Danish), pilrokke (Danish/Norwegian), pilskate (Norwegian), sálahi trygéna (Greek), stechrochen (German), stingrocka (Swedish), trigóna (Greek), trigono (Italian), uge cauda-curta (Portuguese), and whai (Maori). Fished recreationally within its range, the short-tail stingray is considered a game fish. Recreational fishers sometimes spear or harpoon this species for sport. It is also taken as bycatch in various fisheries including inshore trawls, seines, snapper longlines, and purse seines. 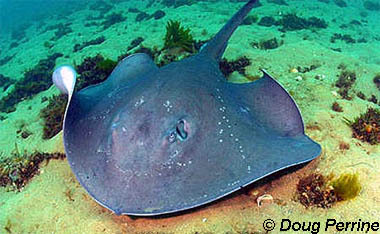 The short-tail stingray is usually discarded or released by fishers after the tails are removed. Divers often observe short-tail stingrays without tails suggesting they survive capture and release without high mortality rates. This ray is also kept at public aquarium facilities and adapts well to display. The short-tail stingray is often observed raising its tail similar to that of a scorpion when approached by divers. This behavior is considered to be inquisitive rather than aggressive. However, the barbed tail spines can inflict severe or potentially fatal wounds so care should be taken if this species is handled. > Check the status of the short-tail stingray at the IUCN website. The IUCN is a global union of states, governmental agencies, and non-governmental organizations in a partnership that assesses the conservation status of species. The “Least Concern” listing is given when the species does not qualify for Critically Endangered, Endangered, Vulnerable or Near Threatened. 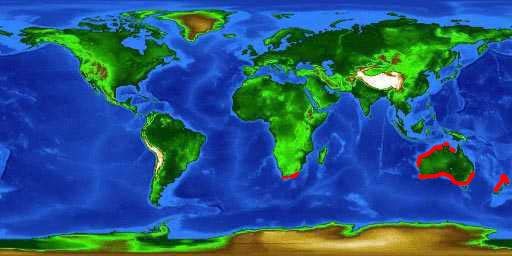 A primarily temperate species, the short-tail stingray is limited to the waters of the Indo-West Pacific region including southern Mozambique and South Africa as well as off the coasts of New Zealand and Australia. The short-tail stingray is abundant to common throughout its range. This stingray has also been reported from Thailand, however it is thought that the specimen was actually a closely related Dasyatis matsubarai. The short-tail stingray is demersal and lives in brackish and marine waters to depths of 1,562 feet (476 m). It lives offshore on the outer shelf and uppermost slope as well as occasionally close inshore. This stingray is found along sandy bottoms, bays, harbors, and near rocky reefs. During the summer months, large midwater aggregations of short-tail stingrays are found around the Poor Knights Islands off New Zealand. Although the purpose of these aggregations is unknown, they may be related to mating. This ray is quite large and thick with a bluntly angular snout. The pectoral disc has rounded tips and the long whip-like tail has a thick base and is the same length or shorter than the body in adult specimens (the tail is longer than the body in young individuals). It has a small upper and a long lower caudal fin fold with the lower not quite reaching the tip of the tail. There are usually two stinging spines, the spine closer to the body is smaller than the rear spine. Sometimes only one stinging spine is present. The short-tail stingray may be confused with the pitted stingray (Dasyatis matsubarai) which has a very similar appearance including the rows of pale spots, however this species is only known from Japan and possibly Thailand. 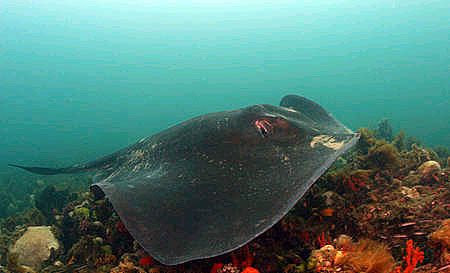 The thorntail stingray (Dasyatis thetidis) is also sometimes mistaken for the short-tail stingray. However, the thorntail stingray lacks pale spots and has thorn-like denticles along the dorsal midline of the disc unlike the short-tail stingray. 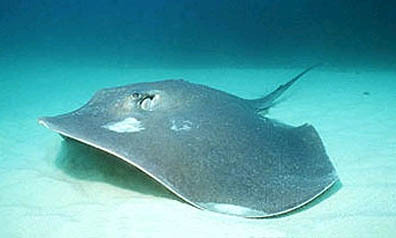 The body of the short-tail stingray is grey-brown or bluish-grey on the dorsal surface. There is a row of small, pale blue spots at the base of each pectoral fin. The ventral surface is white and the tail lacks any distinguishing marks. The teeth of the short-tail stingray are arranged in a pavement manner and extend across the entire width of the mouth. Both jaws contain similar teeth that are rhomboidal in shape. Those teeth located in the posterior rows have broadly rounded cusps. The arrangement of the teeth is 22-1-22 on the upper jaw and 24-1-25 on the lower jaw. On the floor of the mouth, behind the lower tooth plate, there are five oral papillae arranged transversely with three papillae medial and slightly forward and lateral papilla on either side. The disc of this ray is smooth and plain with the exception of a large, slender thorn located on the tail anterior to the stinging spines. The maximum reported size of the short-tail stingray is 170 inches (430 cm) total length as documented in a male specimen. It is reputed to be the largest stingray in the world, weighing over 772 pounds (350 kg). Fish, bivalves, squid, and crustaceans are food items consumed by the short-tail stingray. Courtship behaviors include the male taking hold of the pectoral margins of the female as they swim through the water. The male then orients himself under the female followed by mating. During mating, the male moves his tail from side to side to move the clasper within the female’s cloaca. Mating lasts about 3-5 minutes. This stingray exhibits ovoviparity with embryos feeding on yolk initially and then receiving nourishment from the mother via the absorption of uterine “milk”. This “milk” is enriched with mucus, fat and proteins and is absorbed by the growing embryo through specialized structures called trophonemata. The young measure approximately 14.2 inches (36 cm) disc width at birth. Litter size and gestation period are unknown as are pupping grounds and nursery areas. Killer whales in the waters off New Zealand feed on stingrays including the short-tail stingray. 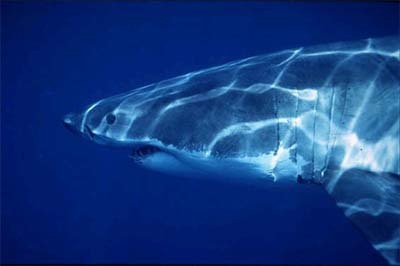 Other documented predators include the white shark (Carcharodon carcharias) and the smooth hammerhead (Sphyrna zygaena). The short-tail stingray was originally described as Trygon brevicaudata by Hutton in 1875. This name was later changed to Bathytoshia brevicaudata, followed by the currently valid Dasyatis brevicaudata (Hutton 1875). 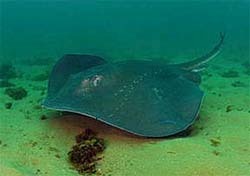 The genus Dasyatis of the currently accepted scientific name is derived from the Greek word “dasys” meaning rough or dense and (“b)atus” meaning shark. The species name brevicaudata comes from the Latin “brevis”, meaning short and “cauda” meaning tail, referring to the short tail that is characteristic of this stingray. Synonyms referring to this species in past scientific literature include Trygon schreineri Gilchrist 1913 and Dasyatis schreineri Gilchrist 1913.